Before and during World War II all computers were special purpose machines, each designed to solve a particular war related problem. After the war computers continued to be invented at a rapid pace, but the focus shifted to general purpose (Turing-complete) machines. In 1945 Turing himself turned his attention to designing a practical general purpose machine. He was still a Fellow of Cambridge University (which he remained until his death) and could have joined Cambridge’s effort, then underway, to design a computer, but instead he chose to form a group funded by the British government, building on the work he had done at Bletchley Park. Unfortunately he failed to take into account how the world had changed with the end of the war. At Bletchley Park Turing and his team had been given whatever they needed. At one point when they were not being allocated enough resources Turing and his colleagues wrote directly to Winston Churchill. The day he received the letter Churchill ordered that Bletchley Park’s needs be given top priority. But after the war Turing found his requests for funding and assistance mired in governmental red tape. The machine he designed in 1945, the Turing ACE, would have been one of the first Turing-complete machines, but it was never completed. Discouraged, Turing returned to Cambridge. Several vacuum tube computers were built followed the Bletchley Park Colossus, most notably the ENIAC in 1946, the first electronic general purpose computer. Although designed to calculate artillery firing tables, it was the first Turing-complete machine, capable of solving any problem any computer can solve. It was called in the press a “giant brain” and it was giant. It contained 17,468 vacuum tubes, so as you can imagine it was out of service a lot with a burned out tube. It weighed 30 tons. It was 100 feet long. Unlike modern computers, it did not store its programs in memory. Instead, it was programmed using patch cords, much like a huge telephone switchboard. One of its first programs was to study the feasibility of the hydrogen bomb. 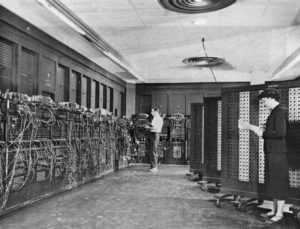 ENIAC was built at the University of Pennsylvania, designed by Professors Eckert and Mauchley. One big problem with the ENIAC machine was the difficulty in programming it. Even before the machine was finished, Eckert and Mauchley came up with a better design. Their EDVAC computer stored its program in memory, a “stored program computer.” It was not completed until August 1949. Unfortunately for Eckert and Mauchley, John von Neumann, who was a consultant on the project, wrote a description of this new design and one of the engineers working on the project, Herman Goldstein, published it, removing all references to Eckert and Mauchley. This resulted in two unfortunate (for Eckert and Mauchley) consequences. They were not able to patent their design, and two teams in Great Britain, using this paper, beat them to the first electronic stored program computers. It is not clear who on the EDVAC project thought of storing the program in memory. The idea may have been kicked around in many places. But, based on his paper, von Neumann is widely credited with the invention, and computers with stored programs (which includes all modern computers) are called “von Neumann architecture” computers. In 1948 a team at Manchester University built the first electronic stored program computer, the Manchester Baby. Turing joined this effort and participated in the design. The Manchester Baby was only a demonstration of feasibility, but it led to the Manchester Mark 1 in April, 1949. This was followed by the EDSAC in May 1949, designed at Cambridge University. The Manchester Mark 1 was the prototype for the first successful commercial computer, the British Ferranti Mark 1, while EDVAC became the prototype for the first U.S. commercial computer, the Univac 1, 16 months after the Ferranti. This entry was posted in Rudd's Blog, Uncategorized and tagged Alan Turing, computing history, early computers, EDVAC, ENIAC. von Neumann, Turing complete, UNIVAC. Bookmark the permalink.